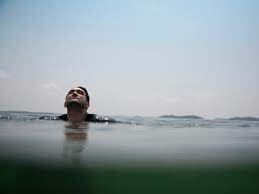 Do you ever feel like you’re treading water spiritually? We PRAISE Him for the rescue. We devote ourselves all over again. We pray more consistently than before. We cherish His presence in our lives. Now, we can actually feel ourselves start to sink if our prayer time fades. Prayer has become our lifeline. So we are praying consistently, going to church, seeking Him and His will for our lives, loving others, learning to love ourselves as He does, and summoning His strength to share. Treading. Our arms and legs start to tire. We start looking around for somewhere to rest. Our ship to come in. And, we may start to wonder…..what next? What now? I have. I think it’s part of our journey. When a week goes by and I feel like I’m treading water, I make a conscious effort to remind myself that at least I’m not drowning anymore! I can breathe and my eyes have been opened, Praise God! My weaknesses have been revealed and my mind renewed. I know where to go for true strength. I know where to turn for truth. I don’t fear truth, I cherish it. I’d so much rather receive truth than be deceived one more day. Then, out of the blue, a raft appears. Jesus says, “not only did I rescue you, I gave you a raft. You don’t have to tread. Rest.” Oh, thank goodness, I need it! And I lie on my raft and I rest. He doesn’t just rescue us from the depths of despair, pain, and deception. He offers a true rest in Him. Sometimes the routine of our lives and the constant waiting for the next big thing feels like treading water. Still, I’d rather tread than drown. I’d rather rest than tread. I’d rather breathe easily than gasp. It’s a life long journey and each one of us are on our own. Not alone, but on our own personal journeys between our personal rescuer and ourselves. Today, enjoy your raft and take a rest with Jesus.